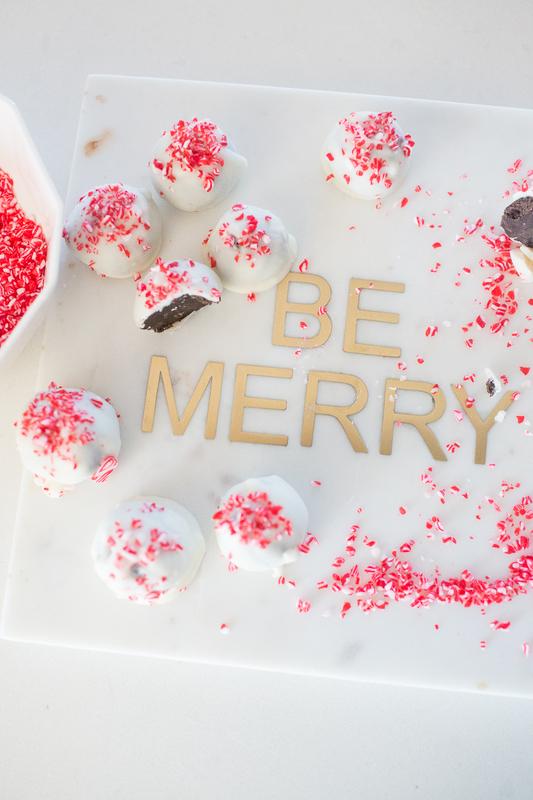 Tis the season which means me and little momma will be cooking it up in the kitchen and without a doubt, our favorite family Christmas dessert is Peppermint Oreo Cake Balls. There isn’t much you need to make this yummy dessert. 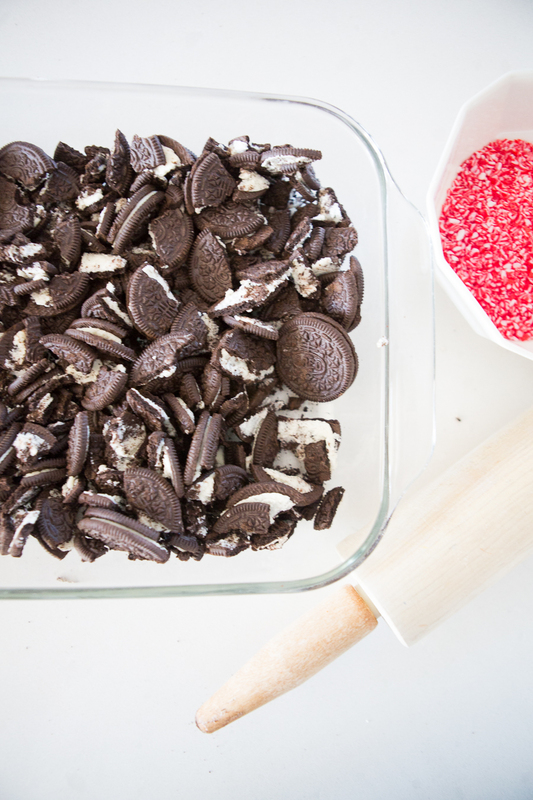 Just some Oreos, cream cheese, almondy park, and peppermint sprinkles. That’s all it takes. BUT, I’m going to tell you all the tips and tricks that we have learned over the years to make these pretty little treats as yummy and as pretty as possible. 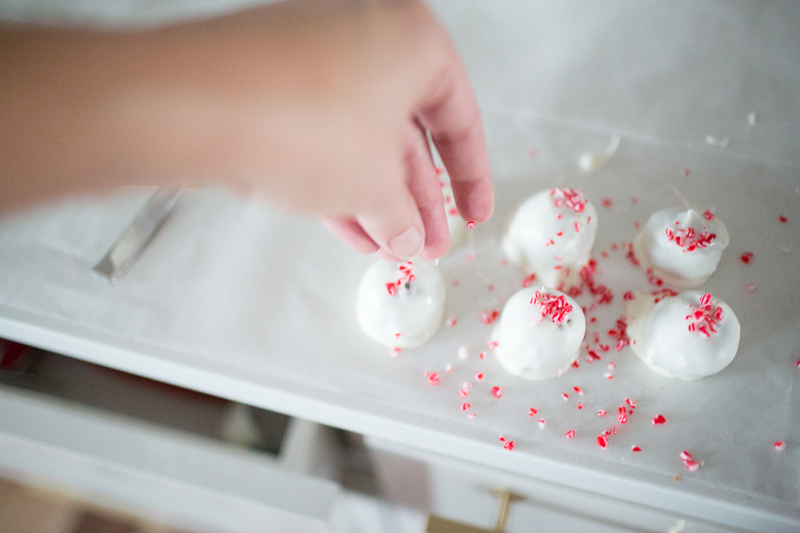 It can be tricky to shape the cake balls, dip them, and sprinkle them and still keep them looking like a pretty little truffle. 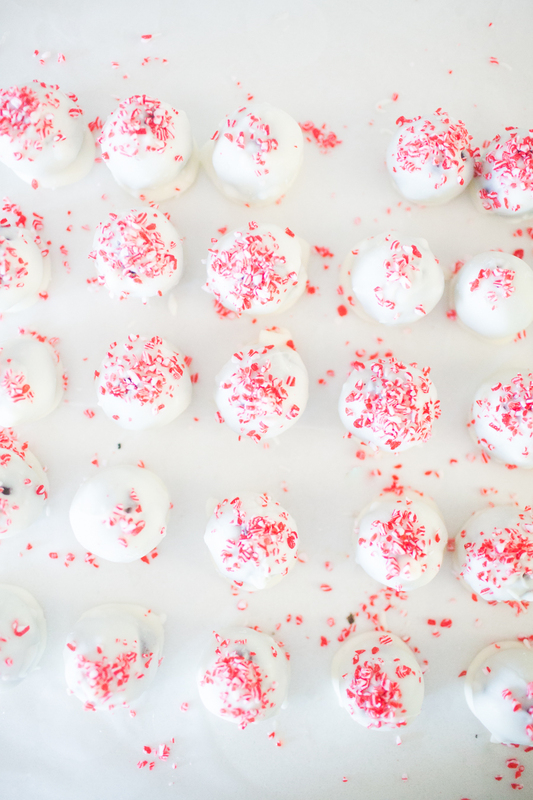 So, let me and little momma tell you how we make these Peppermint Oreo Cake Balls not only yummy, but a gorgeous little treat that you will be proud to have as the centerpiece of any Christmas table or package up in cute little boxes with red and white ribbon and give them out as gifts to your neighbors and friends. 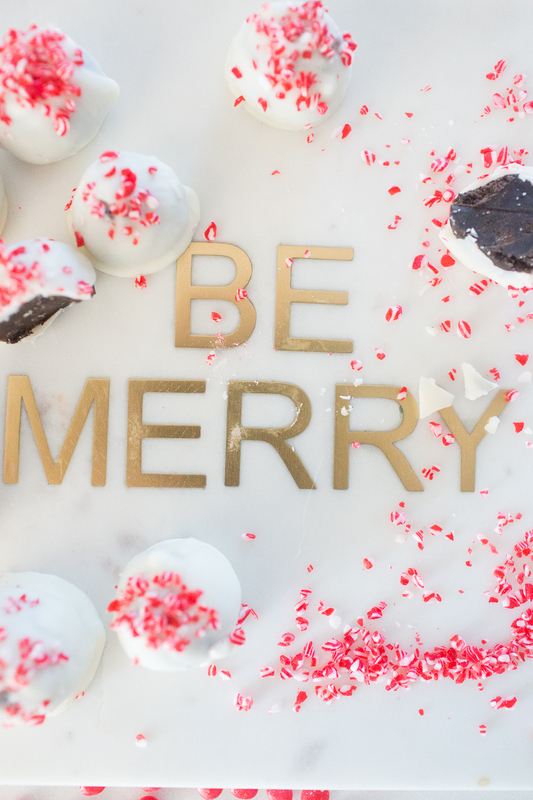 So, without further ado, we give you our favorite Christmas dessert—Peppermint Oreo Cake Balls—and all our tips and tricks to make them as yummy and as beautiful as possible. 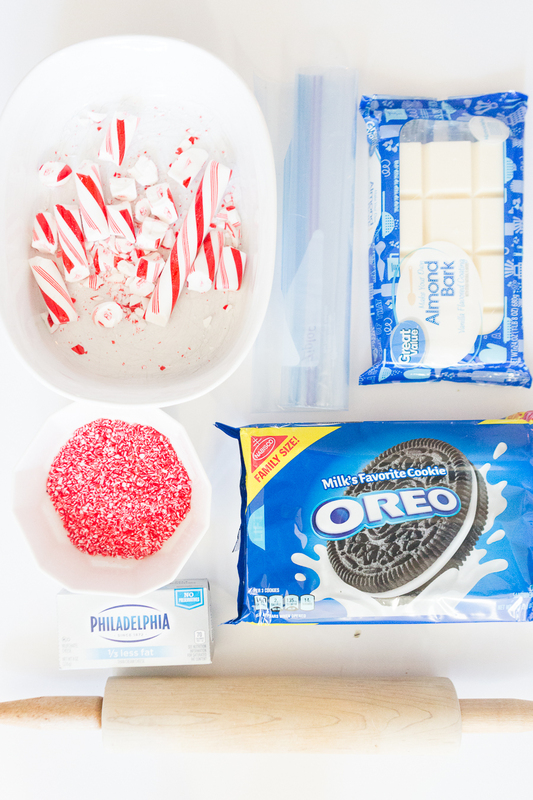 Here is the cast of characters: Cream cheese, crushed peppermint (you can buy this prepackaged or make it yourself but crushing up peppermint sticks or candy canes), almond bark, Oreos, a rolling pin, and large gallon sized Ziploc bags. Crush 1 package of Oreos (see photos below). 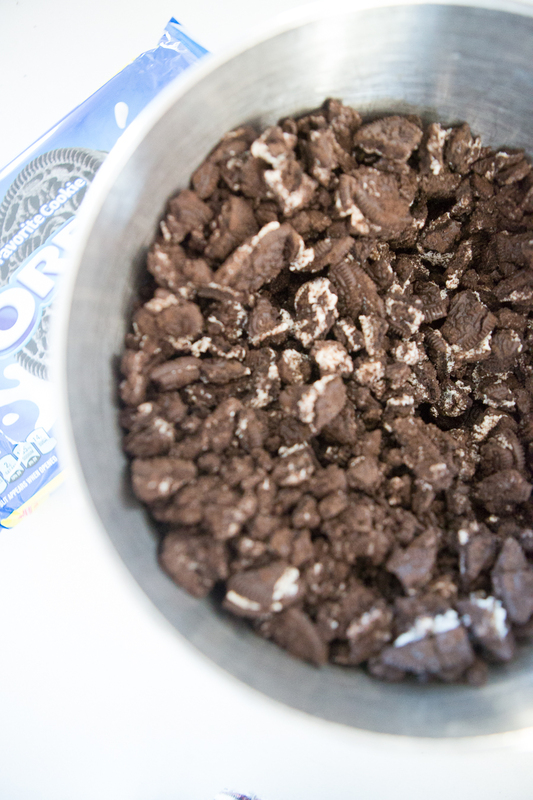 We put the Oreos in a gallon Ziplock bag and crush them with a rolling pin. 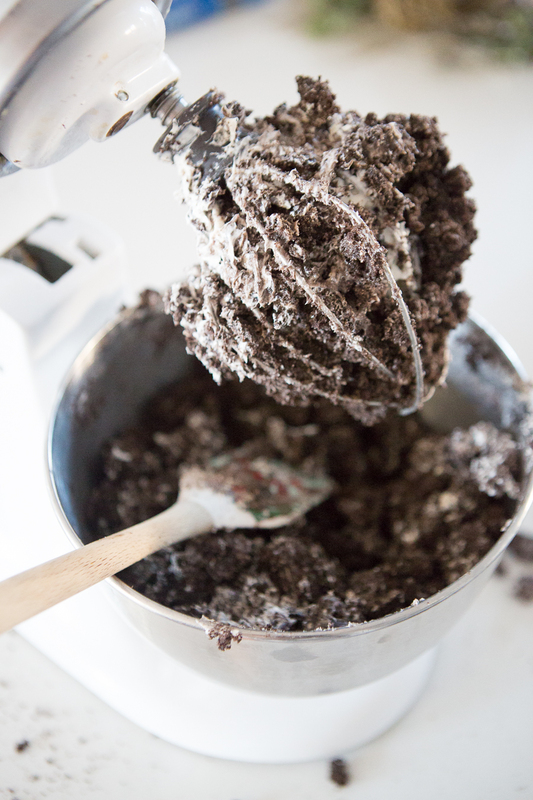 Put the Crushed Oreos in a Kitchen Aid Mixer or a Blender to grind up the Oreos to a fine consistency. 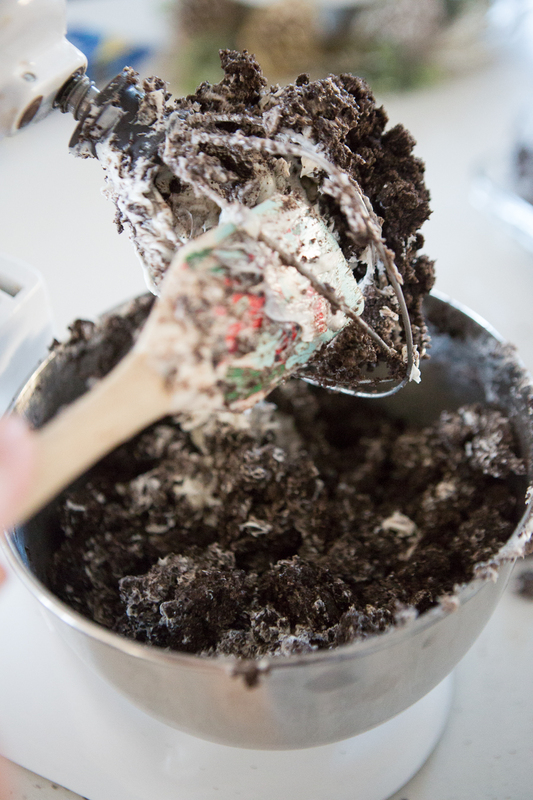 Soften 1 block of cream cheese then mix well (again, I highly recommend a Kitchen Aid Mixer for this) into the blended Oreos. (You will have to use a spatula to push the Oreo mixture out of the blender several times to make sure it is mixed consistently. When you get it to the right consistency, it will look like dirt. 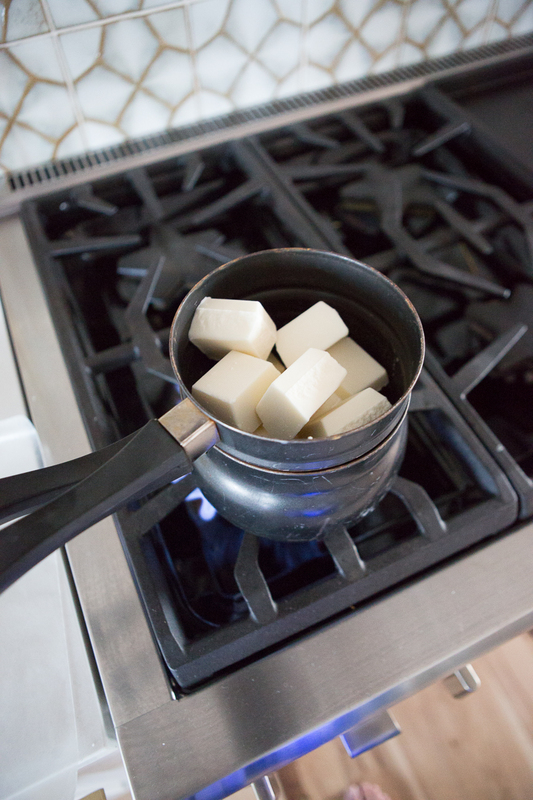 Melt the almond bark in a double broiler; Add 1 tsp of crisco and mix the Almond Bark until it is very smooth. After this, I let the Peppermint Oreo Balls cool, then I put them in a large Tupperware container and layer them with wax paper. I keep them in the freezer then everytime we host a party, I get out some to serve. For your reference, one batch makes around 4 dozen. 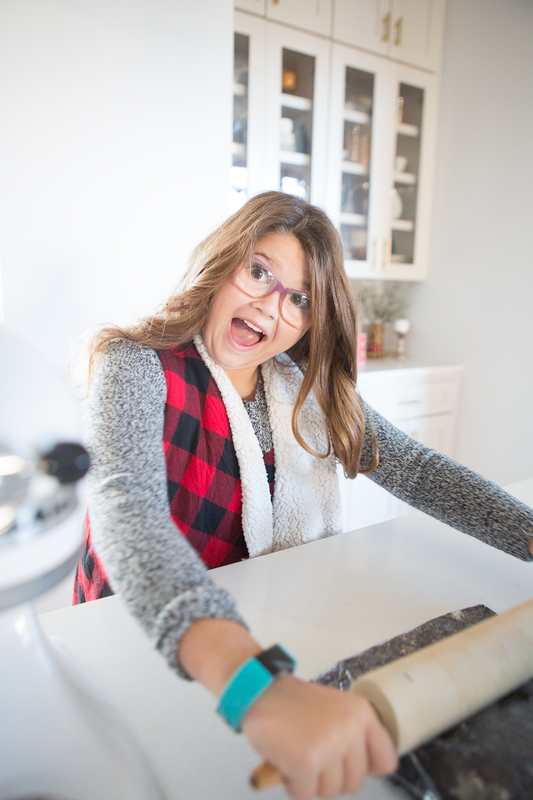 We quadruple this recipe so we can share it with friends and have enough for the parties we host and still have some for Christmas Day of course! 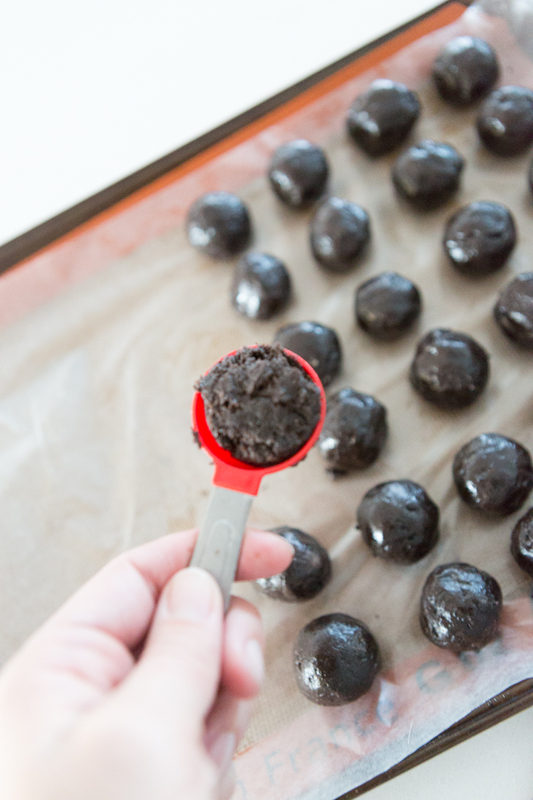 FORM INTO 1 TSP OREO BALLS AND PUT ON A COOKIE SHEET WITH WAX PAPER. 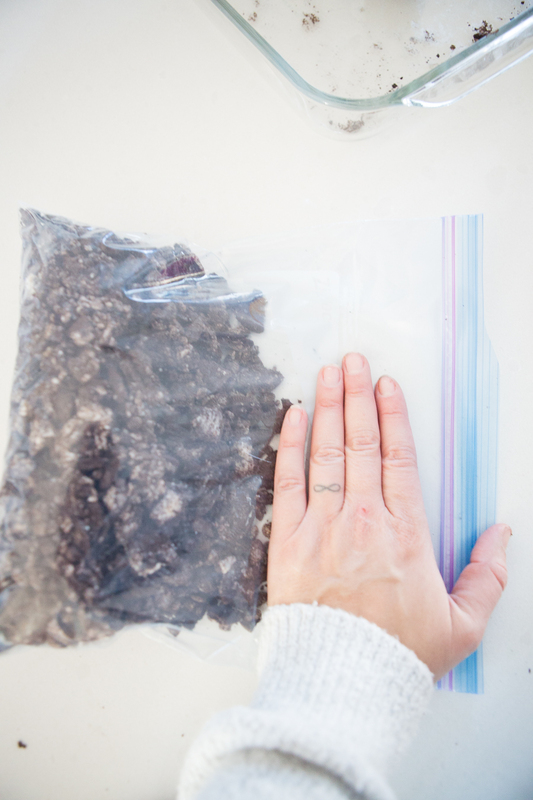 FREEZE FOR AT LEAST 1 HOUR (this is important because it will make it easier to dip them in the almond bark) without them falling apart. 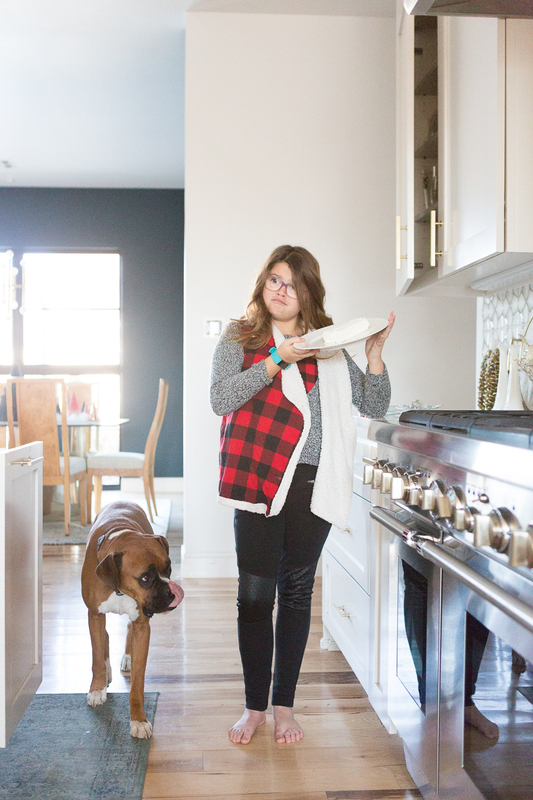 HEAT AN ENTIRE PACKAGE OF ALMOND BARK IN A DOUBLE BROILER . Add 1 tsp of Crisco and mix well until the Almond Bark is completely melted. 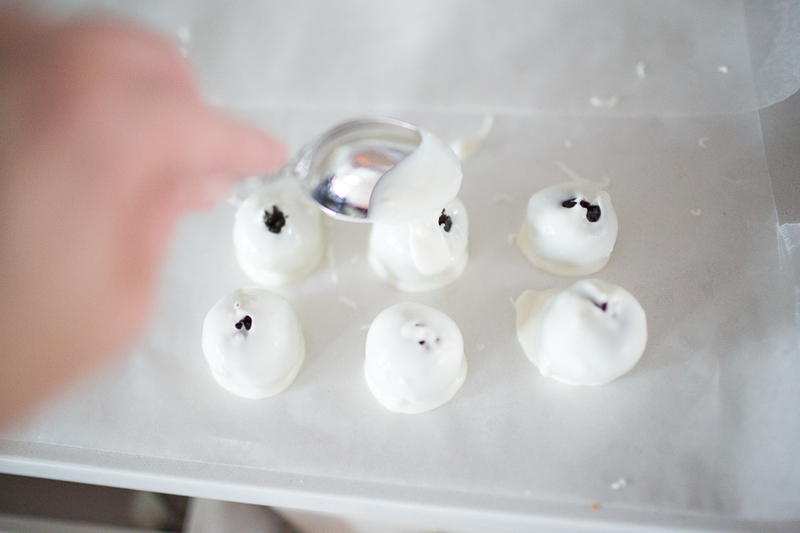 Then, dip the Oreo Cake Balls into the almond bark using a toothpick. I usually dip 6 cake balls at a time, When you take the toothpick out, you will notice there will be a spot on the top that needs to be covered, use a spoon. 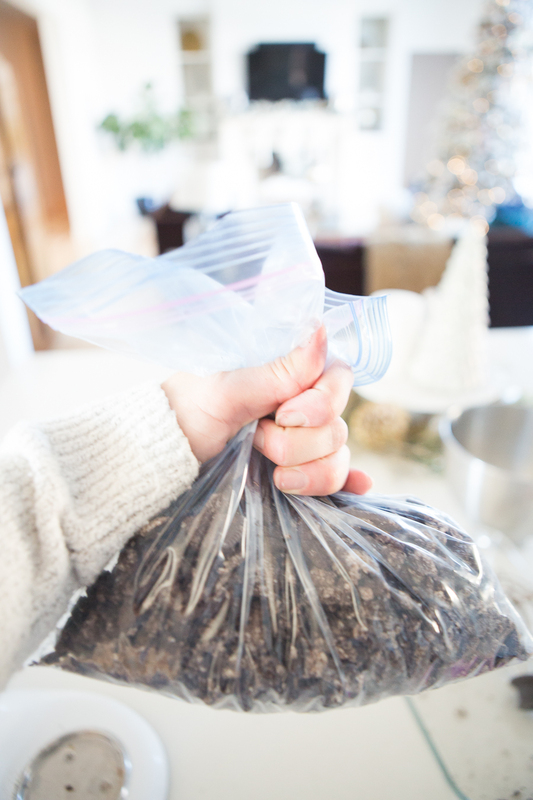 LET THEM COOL THEN LAYER THEM IN TUPPERWARE USING WAX PAPER BETWEEN LAYERS AND KEEP IN THE REFRIGERATOR OR FREEZER. Hi! Love this post. I plan on making these for my office Christmas party. I’m wondering, ok the crisco, do you use the vegetable shortening? Or the crisco oil?